Severneftegazprom guarantees its employees safe and fitting working conditions that fully meet standards for employee health and occupational safety. We recognize that achieving economic effectiveness in production depends on reliable, accident-free equipment and qualified actions on the part of personnel. Therefore, Severneftegazprom pays special attention to issues of industrial and fire safety. Exploitation of dangerous production objects, and at Severneftegazprom we have 9, is executed in accordance with norms and rules that are standard for industrial safety. The company carries out on an ongoing basis administrative and production controls and oversight to fulfill requirements safeguarding worker health and ensuring industrial safety. It works to guarantee the reliability and safety for exploitation of production objects. Severneftegazprom has established a fire-fighting unit of 56 well-trained employees. That department is charged with preventing and localizing fires and eliminating negative consequences in the event of its occurrence. To protect the well-being of employees, Severneftegazprom, among other measures, certifies workplaces as having conditions suitable for work. The company provides instruction for industrial safety that is specific to the type of work and profession of its employees. It also maintains a Personnel Review Board that verifies knowledge of industrial safety and employee health. Employees whose work exposes them to dangerous conditions undergo regular medical examinations. The company provides all personnel with special work clothing, shoes, and other certified means of individual and collective protection. 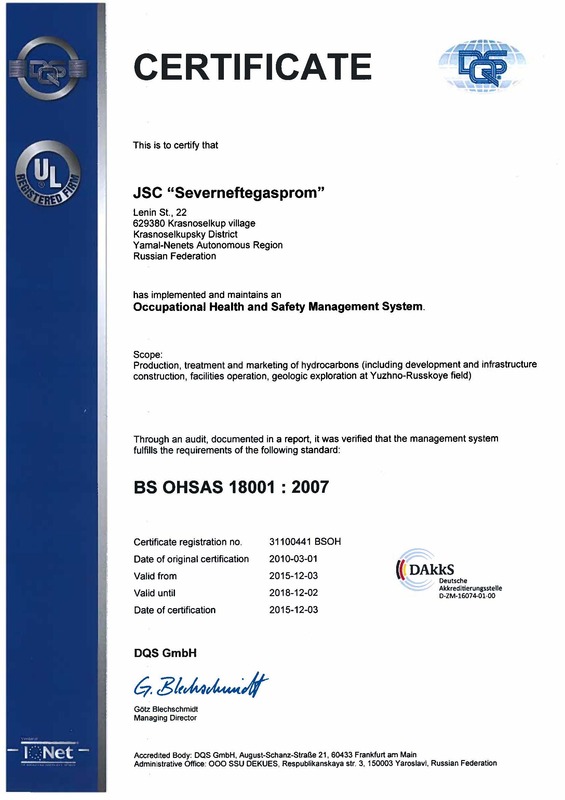 The Severneftegazprom management system in the area of occupations safety and employee health has been certified as complying with international standards OHSAS 18001:2007.